The Hawaii State Teachers Association will announce on Wednesday afternoon whether teachers have voted for or against a new contract. The union says it will tally the remaining 1,900 absentee ballots by 5:30 p.m. The contract offers some 13,000 teachers 4 percent raises in each of the next two school years but requires drug and alcohol testing. If the contract is ratified, teachers would get raises starting in the next school year. If teachers reject the deal, the union and the state would try to negotiate a new contract, said HSTA Executive Director Joan Husted. But any new contract would have to be presented to lawmakers during next year's Legislature because the current session ends Thursday. If that happens, the pay raises would be retroactive to the 2007-08 school year, Husted said. Legislators have said the state would be able to fund the current contract, which would cost $119,380,888. House Finance Chairman Marcus Oshiro said if the contract is not ratified Wednesday, the money would remain in the state's general fund. A sign installed as a safety measure for Waimanalo schoolchildren had bullet holes when a state crew inspected it this week. The state Department of Transportation workers found five bullet holes in the malfunctioning electronic speed display sign near Waimanalo Elementary and Intermediate Schools. "Even if it was a prank, it was a dangerous one," said department spokesman Scott Ishikawa. He pointed out that besides the schools, there are homes in the vicinity of the sign and potentially within range of a gun. "The bullets penetrated the sign and could have hit somebody." Two permanent signs were installed in August on Kalanianaole Highway in response to concerns from the community about speeders on the main road through town. The signals installed near speed limit signs show motorists from each direction how fast they are traveling. If they hit 40 mph, the signs flash a warning to slow down. The pair of signs cost $25,000. The bullet-ridden sign will be repaired, Ishikawa said. Gov. Linda Lingle has ordered state flags at state and county buildings to be flown at half-staff in honor of two former elected officials and entertainer Don Ho, according to a news release from her office. State flags will be flown at half-staff tomorrow in honor of former state Rep. Akira Sakima, who died April 6. Sakima represented Kalihi Valley from 1959 to 1976, and his memorial service will be held tomorrow at the Hawaii Okinawa Center in Waipahu. On Monday state flags will be flown at half-staff in honor of former city Prosecutor Charles Marsland, who served two four-year terms from 1981 to 1988 as Honolulu's first elected prosecuting attorney. Marsland died April 11, and funeral services will be held on Monday at Central Union Church. A memorial service at Waikiki Beach is scheduled for next Saturday for entertainer Don Ho, which is when state flags will be flown at half-staff in his honor. Ho died April 14. 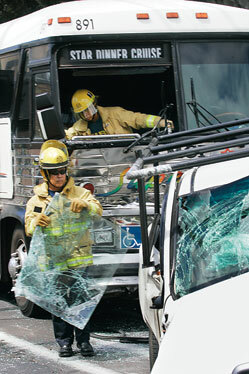 A tour bus and pickup truck collided at the intersection of Kapahulu and Kaimuki avenues yesterday, injuring five people. Firefighters assisted five people who were taken to the hospital, a Fire Department spokesman said. Their conditions were not released. Police responded to a 9:36 a.m. call and kept traffic lanes open while the vehicles were towed. Police arrested a 44-year-old woman yesterday who allegedly slapped a police officer who was investigating a traffic accident. Police alleged the woman was intoxicated during the incident. Police said the woman was involved in a minor traffic accident at 1:16 a.m. near a University of Hawaii-Manoa campus parking lot. When an officer arrived to get information from the drivers, the woman became belligerent and slapped the officer, police said. She was arrested for investigation of assault against a law enforcement officer. She was later arrested for investigation of terroristic threatening after she allegedly threatened other officers at the scene. Officers broke down the door of a Makiki apartment and arrested a 23-year-old man who was allegedly assaulting his girlfriend, police said. The couple had an argument at about 7:10 p.m. Thursday, police said. The victim yelled for help, but the suspect pushed her to the ground, sat on her and covered her mouth while continuing to beat her, police said. When police arrived, she continued to yell for help, instructing officers to break her door down, which they did, police said. The officers arrested the man on suspicion of kidnapping, abuse and resisting arrest. A grand jury indicted an Oahu man yesterday on two counts of first-degree electronic enticement of a child. Matthew Goodman, 28, of Honolulu allegedly had numerous online sexual conversations with someone whom he thought was a juvenile girl but actually was a law enforcement officer. Goodman was arrested by Maui investigators at 4:10 p.m. Wednesday at Kalama Park in Kihei, Maui, after he traveled from Oahu to Maui to meet with the supposed girl. Bail has been set at $1 million. Police arrested a 41-year-old man on suspicion of drug, auto theft and stolen property charges after he was found Thursday morning sleeping in an allegedly stolen vehicle in Mililani. An officer noticed a vehicle stopped in the roadway with the engine running at 3:51 a.m. and the man allegedly sleeping in the driver's seat. The officer found the vehicle was stolen, and discovered a glass pipe and packet of methamphetamine inside the vehicle. The man was arrested on suspicion of operating a stolen vehicle and drug charges. During the booking process, police found another person's credit card, personal identification number and account information on the suspect. They added charges of detaining stolen property and possessing confidential personal information.